Copy of [Paris pastry shop] La Pâtisserie du Meurice par Cédric Grolet（English） — ying c.
professional staff taking care of customers. It's a little space adjacent to Hotel Le Meurice on rue Castiglione. People started to line up in front of the door when it was just opened in the noon. 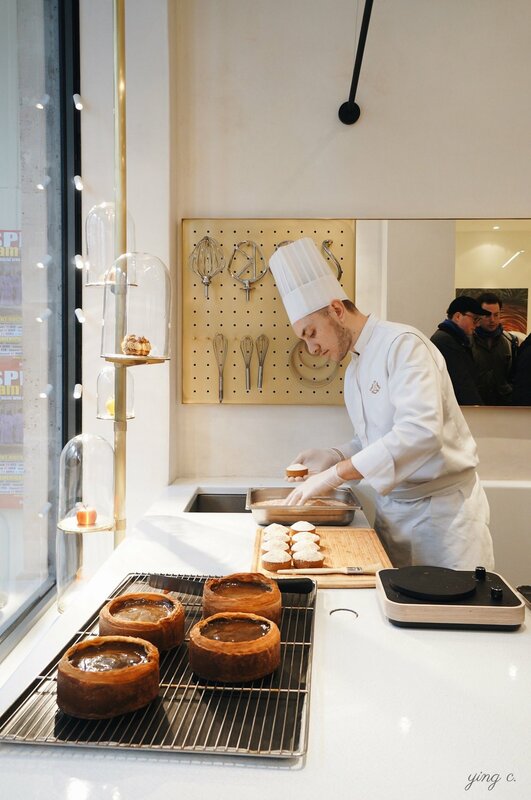 With a young pastry chef in action, Cédric's signature pastries in the vitrine, and professional staff catering for customers, you'd immediately feel the difference as you approach the shop. 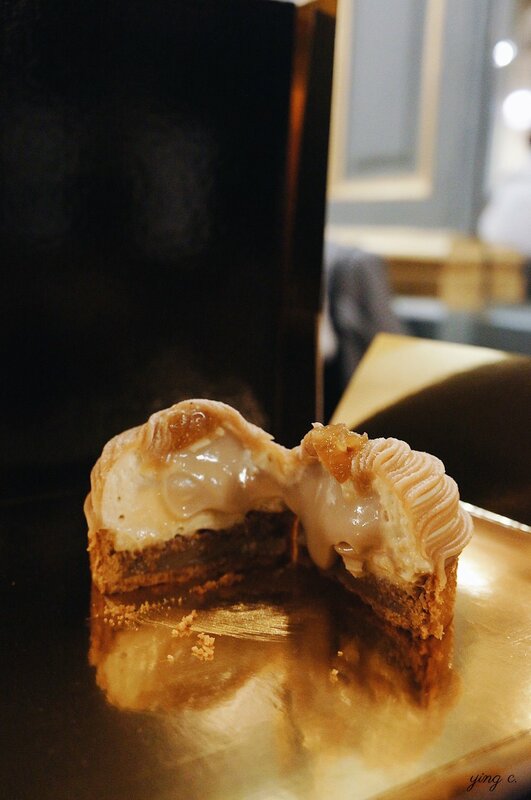 It's like visiting a palace, not an ordinary pastry shop in your neighbourhood. Rubik’s Cube, one of Cédric’s signatures. Since I've interned at Le Meurice before, I've got the chance to taste most of Cédric's creations during the internship (and that's probably why I didn't have that trigger to visit the shop right away). 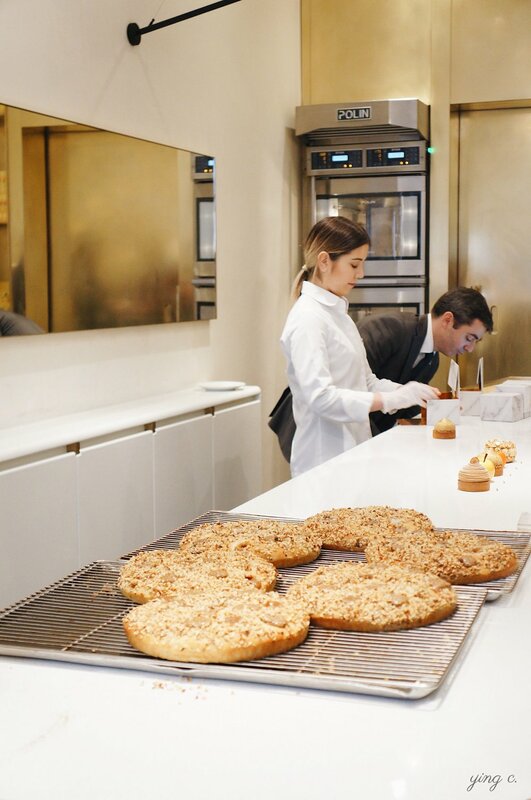 In general I'm not so curious about how they taste, but we still picked up ONE OF EACH individual pastry in the shop that day, excluding the viennoiseries and flan: the Tarte Noisette, the Tarte Mont-Blanc, the Paris-Brest, the Mandarine, and the Pomme Jaune. They were unsurprisingly made with absolute perfection, just as how maniac Cédric is. I guess slacking off at work would never be considered an option in his life. (from right to left and back to front): Tarte Mont-Blanc, Tarte Noisette, and Paris-Brest. mandarin orange (Mandarine) fruit sculpture. Having said so, I still feel that it's a pity that he spends less time in the labo at the hotel. Although revising and perfecting an existing creation is very important, take the Noisette 2.0 for example, I would actually love to see more of his creations and new ideas. 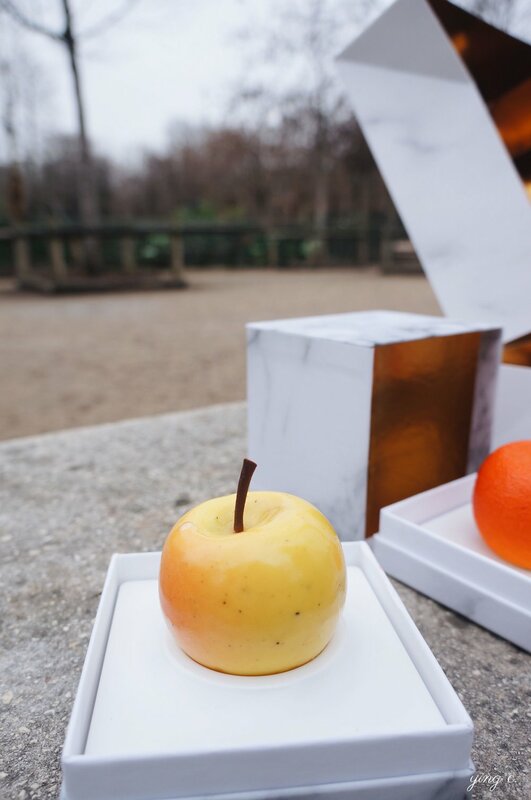 His fruit sculptures are evolutionary for no doubt, but it's definitely not a limit. I'm so looking forward to see something more than that and other than that, while he's absolutely capable for it.